Well this pig of a kit is finally done. I generally knock a build out in 2-3 weeks. This one took over a month. I honestly cannot say it was a fun build. I was excited about the subject, but Revell's kit sucked every ounce of joy out if the build. From the awful end-opening box, to misnumbered parts, more flash than actual parts, incorrect instructions, and the absolutely ridiculous level of over engineering and poor fitting parts this is a kit that I am glad to see the back of. Having said that I'm fairly happy with how it turned out overall. I was a little unsure of the scheme at first, but after the construction nightmare I was not in the mood to tackle my original idea of a Euro I scheme. However the somewhat Hill Gray style camo has grown on me and I'm fairly happy with it. Better planning while spraying would have let the tail decals stand out a little better, but overall, I'm happy. 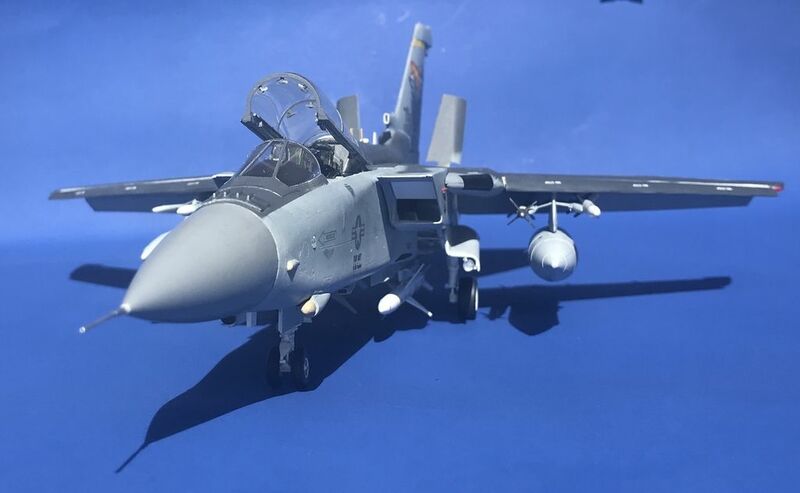 Operation Desert Shield/Desert Storm in 1990-91 delayed plans for a 1991 competition between the F-16, F-15, and Tornado to replace the USAF's fleet of aging F-4G Phantoms in the "Wild Weasel" SEAD role. Peace Dividend budget pressures and the costs of the Gulf War also put pressure on the program, but the war did highlight the value of a dedicated SEAD platform, while at the same time showing that the F-4G was nearing the end of its career. 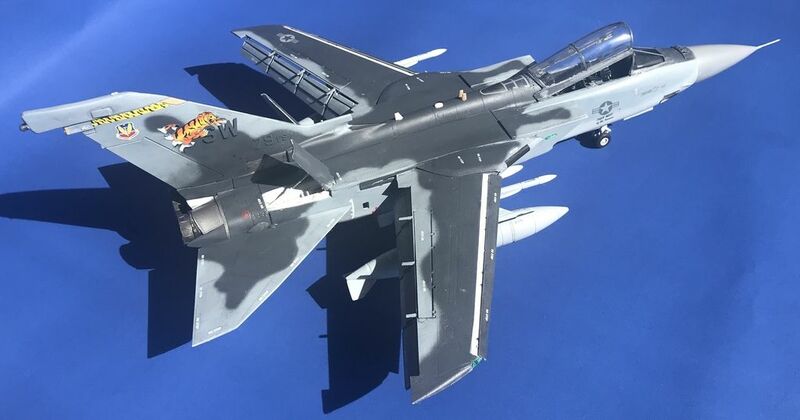 In an effort to save costs, and in part because of the Tornado's performance and to thank the UK for their significant contribution to the war, the Pentagon decided to place an order in mid 1991 for 124 Wild Weasel Tornadoes. Designated the F-24A in US service the first "American" Tornado flew a remarkably short 6 months later in December 1991. 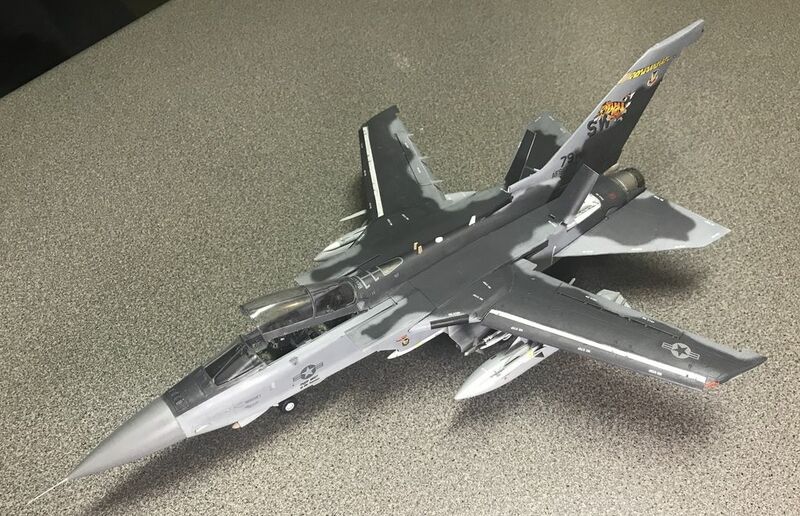 In fact this first US Tornado was a heavily modified RAF Tornado F.2 taken from storage. For budgetary reasons it flew as a "proof of concept" aircraft in December receiving a USAF 1991 serial number, but shortly was sent to Rockwell's Palmdale, CA plant for complete conversion and modification. When it flew as a production aircraft in June 1993 the aircraft had been modified for the SEAD role. 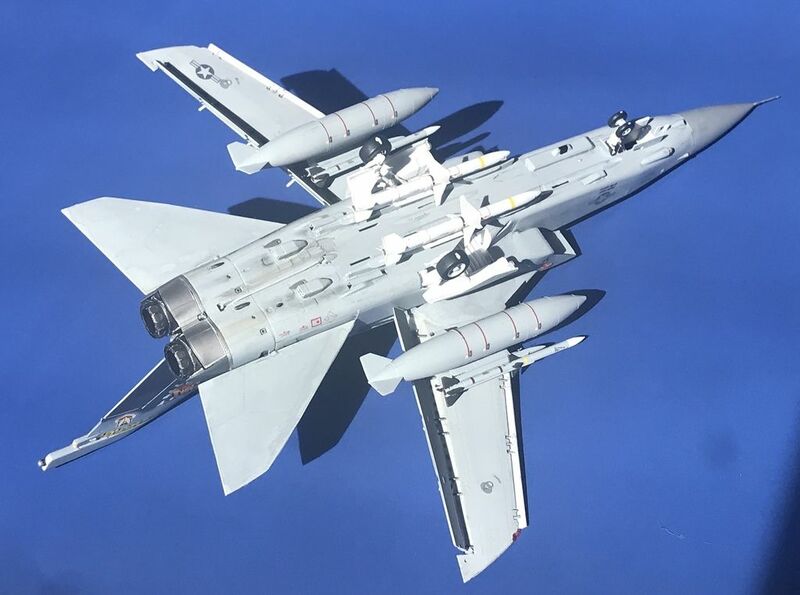 Since budget was a large driving force in the program, the original plan for a heavily modified Tornado IDS was shelved in favor for a less modified ADV airframe. The longer fuselage of the ADV allowed for greater fuel carriage, and the additional fuselage length made the addition of a boom refueling receptacle along the spine easier. Other modifications included US specific avionics (though a great deal of the F.3s excellent EW suite was retained). US avionics included systems for carriage of the AGM-88 HARM missile, and classified avionics carried in a fairing at the top of the vertical fin. US United Technologies ACES II ejection seats replaced the Martin Baker seats in the F.3, and a modified AN/ALQ-131 system was fitted semi-internally with some components taking up the space of the forward left MRAAM bay. The other three semi-recessed missile bay were retained, though AMRAAMs were rarely carried by F-24s outside of missile training, as carriage interfered with the IDS belly pylons fitted to carry two AGM-88 HARM missiles. The IDS outer pylons were also carried frequently, carrying a further two HARM missiles. Inboard pylons were RAF standard and normally carried Sidewinder and/or AMRAAM missiles, or a combination of both. Consideration was given to fitting the US M61 Vulcan or GAU-12 Equalizer cannons, but in the end budgetary issues, and the expected limited cannon usage in the assigned role lead to the F-24 retaining the Tornado's Mauser 27mm cannon. Following the first two modified F.2s, BAe supplied 22 complete "green" F.3 airframes to Rockwell for conversion, before Rockwell assumed production of some components, After the first 24 aircraft US Tornadoes had approximately 60% US content, with the Panavia partners providing some completed components for final assembly. The F-24's engines were license built by Allison as the TF-44, based on the Turbo Union RB.199-104. 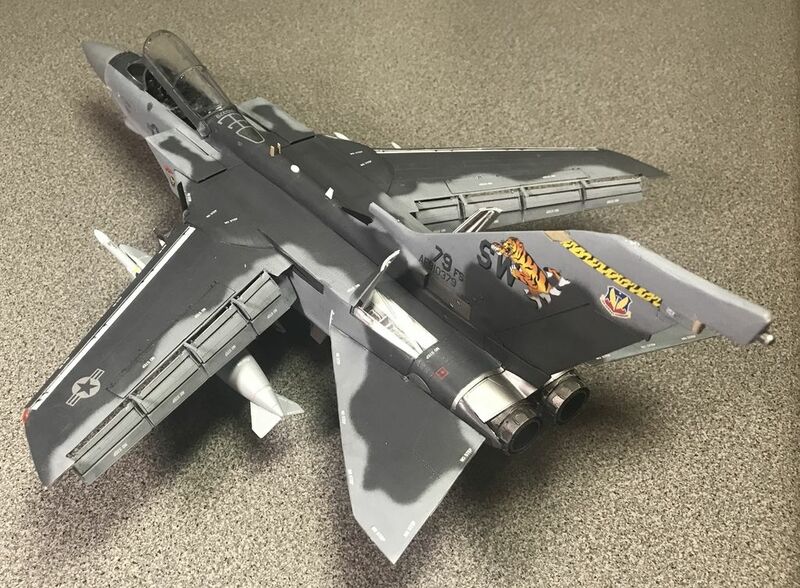 This build represents a 79th Fighter Squadron F-24A in early 2002, still wearing the special markings it wore during the Tiger Meet of the Americas at Buckley AFB in August 2001. By early 2002 the squadron had deployed as part of Operation Southern Watch, patrolling the skies of Iraq as part of the effort to contain the regime of Saddam Hussein. 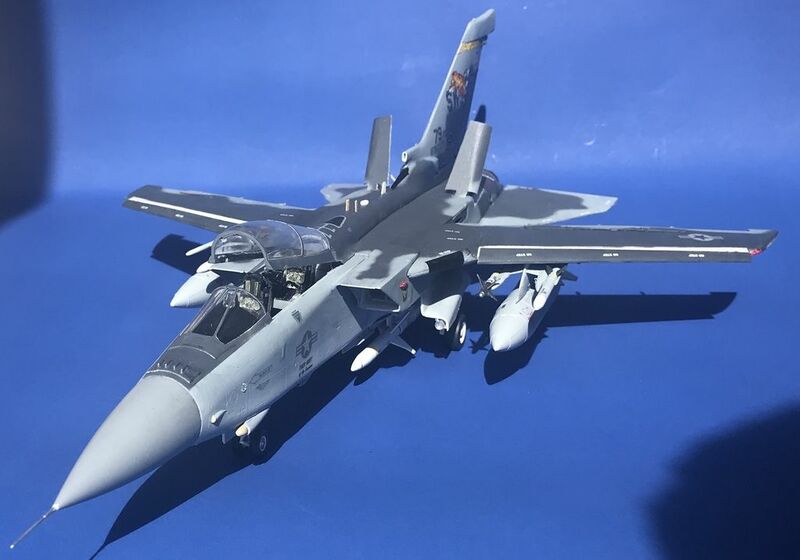 It carries two AGM-88 HARM missiles (the only offensive air-to-ground ordnance carried during Southern Watch) as well as a pair of AIM-120C AMRAAM missiles and a single AIM-9M. It is also equipped with the tail fairing mounted towed decoy system added in early 2000. More pics showing the HARMs in the newt few days. Almost very possible, and well done! Member of the Deluded Dozen, the Blue Rose Society and Peninsula Poets. I do like that. I'm quite a fan of those greys together, I particularly like the scheme on the T-38's. Shame the kit was a pig, (I've wondered about buying the kit and might avoid it now) but it's a silk purse from a sows ear. Yay Glamour Shotz (TM) !!! Looks even better in these.